Amid a seemingly endless stream of bad news, there may be a glimmer of hope for the American auto industry. According to an article in this morning's USA Today, Iraq's recent increase in stability has translated into a new and thriving auto market, and the car of choice is the SUV. For prosperous Iraqis, Hummers, Jeeps, and GMCs might just be the new status symbol. In many ways, this couldn't come at a better time. Last summer, SUV sales tanked, with Ford (F) sales falling by 53.0%, and Hummers dropping by 50.9% over the previous year. Although falling gas prices have caused a recent bump in demand, SUV sales are still hurting. Even if gas prices stay low, the future doesn't look bright for nonhybrid SUVs. With the president of Exxon Mobil (XOM) endorsing a carbon tax and talk bubbling of a minimum gas price, the smart money says that gas-guzzling trucks and SUVs are a dying concern, at least in the United States. With this in mind, General Motors (GM) recently opened a $300 million plant in St. Petersburg, Russia, capitalizing on its 10.9% market share there. It is also continuing its search for a buyer to pick up its Hummer line. The current front-runner still seems to be Indian car company Tata (TTM), although there are rumors that Russian and Chinese manufacturers are also interested. Still, while fuel prices are a concern in the United States, they aren't as important in Iraq, where gas costs approximately $1.65 a gallon. Moreover, given that the war-torn country is sitting on the third-largest oil reserves in the world, it seems unlikely that prices will rise significantly; this means that even a gas-guzzling beast like the Hummer H3 is a relatively affordable fill-up. Perhaps more importantly, America's occupation of the country has offered considerable evidence of the Hummer's effectiveness. Having seen military models of the vehicle cruising over the country's poor roads, Iraqis have little question about the Hummer's ability to navigate their tattered infrastructure. Although the hulking cars are flashy, they are also sturdy, and convey both the image of wealth and the feeling of security. 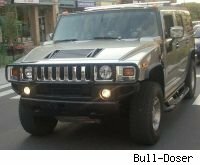 Regardless of whether or not the line ends up selling, GM seems to be planning its Hummer endgame. However, with used H3s in Baghdad selling for $30,000, or 25% over their current asking price in the United States, it's worth wondering if a former battleground might be next years big sales market.